Our family loves to visit the zoo. We started visiting zoos when the boy was 5 or 6, and since then we’ve been to zoos all over the country. There’s much more to do at zoos now than just walk exhibit to exhibit and eyeball the animals like when I was a kid. When we travel for extended track meets with Alexandra we always look for fun, but low energy activities to do on her day off. So while we were in Des Moines for the Junior Olympics, we chose to visit their zoo. And it did not disappoint. Here are 5 things you will love about Blank Park Zoo. Alexandra loves animals and nature. So she’s all in for any opportunity to interact with them directly. Blank Park Zoo has several opportunities for animal feedings throughout the day. The camel rides at Blank Park Zoo are easily the featured attraction. When I saw camel rides were an option, I knew that would be something Alexandra wanted to try. The ride is guided by the zoo keepers and you sit inside a harness. It’s totally safe. Neither Harold or I fell off, and I don’t think you will either. All kids love petting zoos. The one at Blank Park is barnyard themed and reminds me of the farms we visited on field trips as urban elementary school students. The petting zoo not only includes feedings, but mineral mining, and of course the friendly animals who like to be petted by excited children. The first time I saw a live Sea Lion show was when our family went to Sea World. Now, at nearly every zoo with seals and sea lions, feeding time has become a showcase of talent for these gifted animals. Blank Park Zoo was no different. You can even go a step further and get the upgraded behind the scene experience with a zoo keepers and the seals. The thing I enjoyed most about Blank Park Zoo was the number of opportunities to get up close and personal with animals. 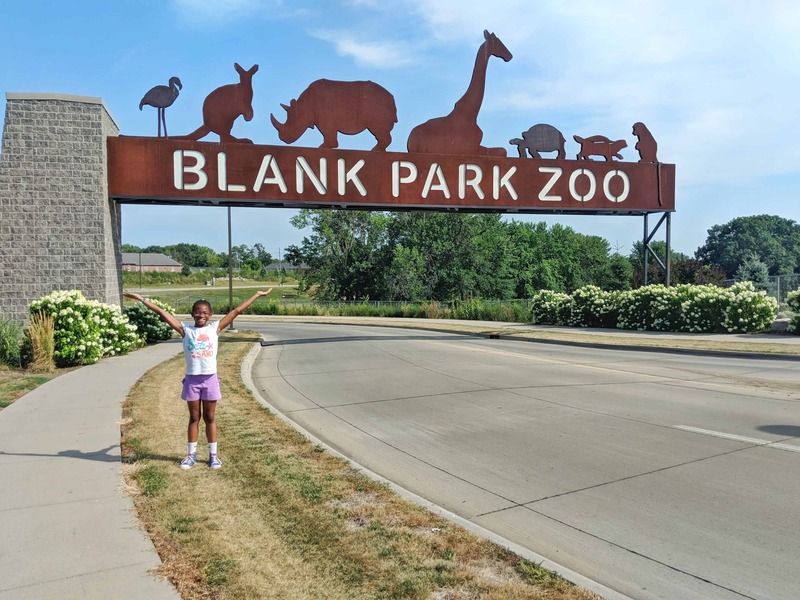 Whether it was feeding the giraffes and parakeets, petting the goats, riding the camel, taking a photo with the tiger, or having a chat with the alpacas, Blank Park Zoo offers multiple opportunities to experience the animals in an up close and personal fashion. And because it’s not a very large zoo, you can hit all the featured attractions in one day and still make it home for dinner. What’s the best zoo you’ve ever visited? What did you like about it?